LET’S DO IT AGAIN FOR MUSIC EDUCATION! The Symphony Striders believe in the way music allows us to connect, express, and explore. We are the driving force behind the Symphony’s Education and Community Outreach programs, which put instruments in the hands of children and create opportunities for Nova Scotians of all ages and abilities to create, discover, and explore through music. 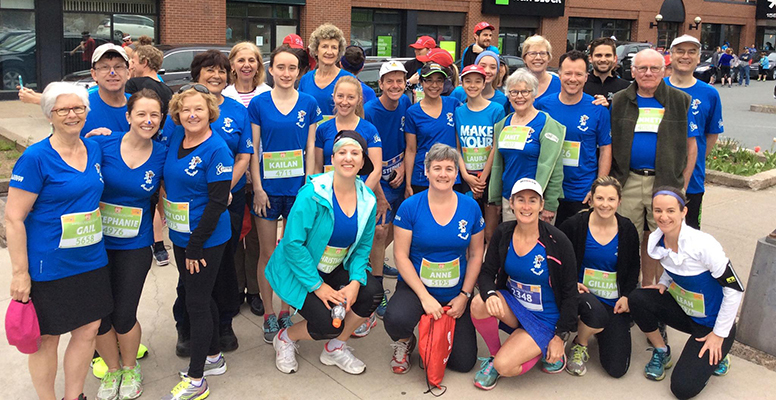 The Symphony Striders have been the largest fundraising team in the Blue Nose Marathon for four years running, and in that time have raised over $80,000 for Symphony Nova Scotia’s Education and Community Outreach programming. Follow us on Facebook, Twitter, and Instagram, and don’t forget to use the hashtag #MusicMadeMeDoIt! Sign Up for the Blue Nose Marathon here. Already registered for the Blue Nose? Join the Symphony Striders! Help us reach our fundraising goal. Donate to our team! Your participation allows Symphony Nova Scotia to continue to enrich and empower lives through music. For detailed information about Link Up, School Concerts, Seniors Concerts, Classical Munchkins, and our Free Family Series, email Jordan.